Indian IT services giant HCL Technologies is expanding its reach in the Nordics with a third service delivery centre in the region. 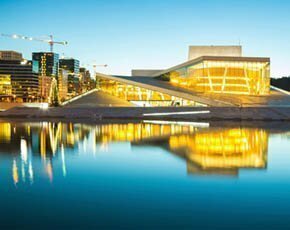 With about 100 staff, the newly opened centre in Oslo will serve as a hub to provide IT infrastructure and application services to its customers in the Nordics. First to benefit from the Olso centre is DNB, Norway’s largest financial services group, which signed a $400m deal with HCL in May 2014. The seven-year agreement includes management of IT infrastructure services and core applications for all DNB businesses. According to HCL, the centre will also support Digital Agenda for Norway – the Norwegian government's initiative to optimise the country’s ICT sector and public services. The digitalisation project aims to simplify, improve and modernise public services in Norway. “HCL has a number of existing customers and partners in the Nordics,” said Kumar, adding that the local government’s focus on the digital agenda is more reason for HCL to invest in local resources. Norway’s biggest bank has outsourced IT operations to Indian service provider HCL in a seven-year deal worth $400m. Wipro, one of India's big four IT services providers, is to expand its workforce in Scandinavia and has appointed a local executive to lead its operations in the region. HCL has established a team in the Nordic region, one to cover Germany, Austria and Germany, another for France, a team to look after the Benelux, as well as an Italian outfit. The Oslo centre, located in the Barcode business area, will add to HCL’s existing service delivery facilities in the Nordics, which are in Espoo, Finland, and Stavanger, Norway. HCL, which employs more than 100,000 people in 31 countries and has annual revenues of $5.7bn, entered the Nordic market in 1999 when it opened its local headquarters in Stockholm, Sweden. The company setup in Norway in 2010. Currently, HCL has about 800 staff in the Nordics, across six offices in Finland, Sweden, Norway and Denmark, in addition to the three delivery centres. HCL’s main focus areas in the Nordics are digitisation, service integration and management, next-generation datacentres and workplace services. Its customers include Statoil, Ikea, Nokia and UPM. HCL is not the only Indian IT supplier strengthening its presence in the Nordics. IDC Nordic analyst Johan Hallberg said Indian service providers have grown their market share significantly in the past two years due to aggressive recruitment. Other major Indian IT companies operating in the region include Tata Consultancy Services (TCS), Tech Mahindra, Infosys and Wipro.